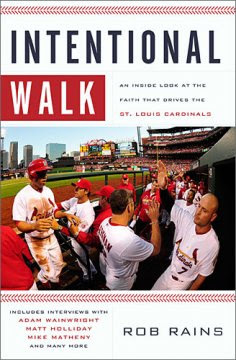 Intentional Walk: An Inside Look at the Faith that Drives the St. Louis Cardinals is a 2013 book by Rob Rains. Here, Rains collects the Christian testimonies of Cardinals players, prospects, and staff. These mini-biographies and vignettes from a relatively large number of players paint the picture of a surprisingly and impressively deep and extensive camaraderie and Christian fellowship. Many of these players don’t speak publicly about their faith, and in that respect, the accounts in this book are a rare insight into the spirit and mentality of the team. The vast majority of the testimony in this book concerns Christian faith as it relates to overcoming adversity – toiling in the minors, dealing with injuries, getting traded, and so forth (although Skip Schumaker’s chapter is a notable exception). As such, the book can feel pretty repetitive, and it may be better consumed in small doses. The back cover states this book takes “an in-depth look at the role the Christian faith plays” in these people’s lives, but this isn’t always the case. It certainly is in some places – the Matheny and Wainwright sections are particular highlights in this regard – but not in others. The Rip Rowan chapter never explicitly mentions Christianity at all. And in the David Freese chapter, Rains refers to Freese’s 2009 DWI only as an “off-field incident.” To anyone who was following the Cardinals at the time and remembers Freese’s “incidents,” this feels like a dishonest cover-up, one that distracts and detracts from Freese’s testimony. More impressive than the testimonies themselves is the fact that so many Cardinals are committed Christians that make up such a solid support group. In all, then, Intentional Walk is a worthwhile read that may appeal to Christian Cardinals fans, Christian baseball fans in general, and Christian residents of the St. Louis area.